When considering purchasing a two way radio system, one of the most important factors to consider is where the devices will be used. For example, devices that are intended for use in harsh outdoor situations have different features than those intended solely for indoor, close-range use. But what if you need a device that performs optimally in both indoor and outdoor environments? There’s no need to sacrifice functionality or carry multiple radios for different uses. A number of devices offer the flexibility to be used in a variety of indoor and outdoor settings, and we’ve profiled three of our top picks below. This affordable and versatile business walkie talkie is well suited to a variety of industries such as construction, education and property management, where employees might be spaced out in different locations in the same general area. With the use of an extended antenna accessory, the coverage area is up to 350,000 sq. ft or multiple floors inside. In addition to exceptional coverage, the DTR650 has a minimum battery life of 14 hours and weighs just 7.6oz, making it incredibly lightweight and portable. This small device packs a lot of punch, but is only 900MHz, meaning that you do not require a license to operate it. 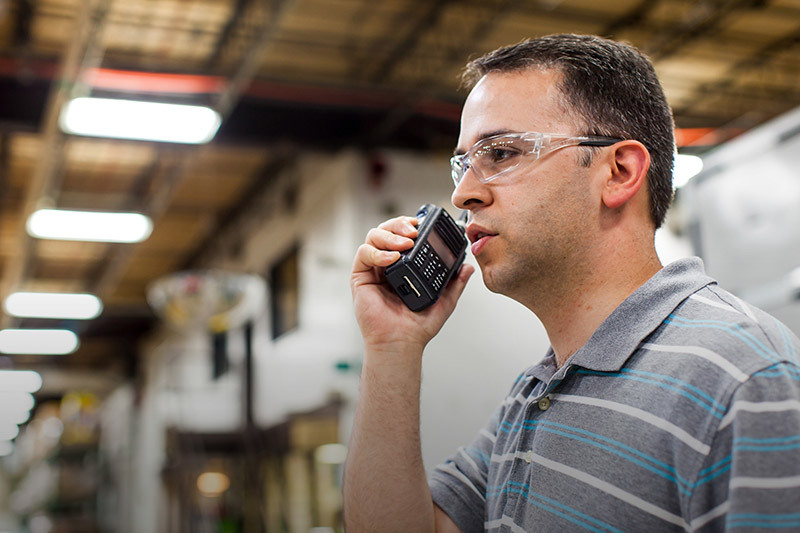 The MOTOTRBO series of devices combines two way radio functionality with the latest in digital technology. The XPR3500 is a versatile and powerful two way radio that has the added flexibility of being completely scalable and functions in both analog and digital modes. This means you can make the transition from analog to digital at your own pace, when the time is right for your business. This two way radio packs a lot of power while still being light weight (10.8oz) and portable. The XPR3500 is also extremely durable; whether you use it indoors or outdoors, you can have full confidence it will withstand the rigors of the job. Rated IP55 for water protection and US Military 810 C,D,E,F and G, in addition to the standard Motorola two-year warranty. This sleek and stylish two way radio is perfect for highly mobile professionals in a customer service-oriented setting. Designed specifically to meet the needs of the hospitality industry, this lightweight (5.39oz!) and discreet 2 way radio will keep you connected wherever your job takes you. Intelligent Audio technology ensures that your communications are always clear and easy to understand. With an average standard battery life of 8.5 hours, you can feel confident you won’t lose power in the middle of a shift. An added benefit of this particular model is the ability to use Bluetooth audio, which ensures you can stay connected and work more efficiently even when discretion is required. Whether your on-site needs extend over several square feet, multiple buildings, or outdoor environments, we have a two way radio solution to meet your specific needs. We offer 2 way radio solutions to a wide variety of businesses, both big and small. Contact us today to see how we can help you stay more connected. Or, download our FREE Portable Two Way Radio Selection Guide below for more information on determining which 2 way radio is right for your business.